Definition at line 56 of file MinGW.h. Definition at line 370 of file MinGW.cpp. References clang::driver::ToolChain::getDriver(), clang::driver::ToolChain::getFilePaths(), clang::driver::ToolChain::getProgramPaths(), llvm::str(), and clang::driver::Driver::SysRoot. Definition at line 541 of file MinGW.cpp. 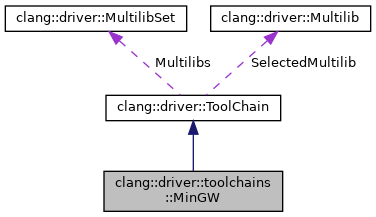 References clang::driver::ToolChain::addSystemInclude(), clang::driver::ToolChain::CST_Libcxx, clang::driver::ToolChain::CST_Libstdcxx, and clang::driver::ToolChain::GetCXXStdlibType(). Definition at line 516 of file MinGW.cpp. References clang::driver::ToolChain::addSystemInclude(), clang::driver::ToolChain::getDriver(), clang::driver::ToolChain::GetRuntimeLibType(), P, and clang::driver::ToolChain::RLT_Libgcc. Definition at line 467 of file MinGW.cpp. Definition at line 420 of file MinGW.cpp. Definition at line 424 of file MinGW.cpp. Definition at line 453 of file MinGW.cpp. Definition at line 459 of file MinGW.cpp. Definition at line 405 of file MinGW.cpp. Definition at line 428 of file MinGW.cpp. Definition at line 403 of file MinGW.cpp. Definition at line 442 of file MinGW.cpp. Definition at line 448 of file MinGW.cpp. Definition at line 446 of file MinGW.cpp. Definition at line 432 of file MinGW.cpp. Definition at line 472 of file MinGW.cpp.